Think BlackBerry is only for corporate executives? Think again. Las Vegas will have a new kid in town at the 2008 Consumer Electronics Show! You can expect quite a buzz around booth #30333 in South Hall 3. Make plans to drop in so we can demonstrate all the ways BlackBerry can enrich your personal life. Whether it’s watching videos, listening to music, playing games, selecting devices and accessories that reflect your personal style, or taking advantage of a range of other capabilities, you’ll see that BlackBerry is not just for business anymore! 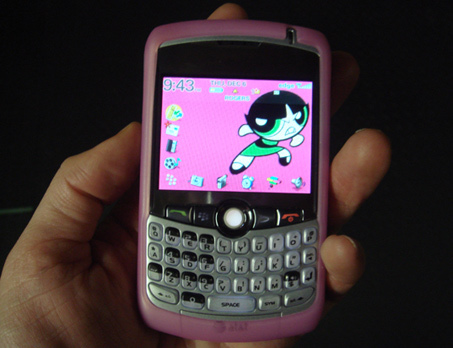 When it comes to Consumer BlackBerrys, I can't help but think of my girlfriend Erika's pinked up BlackBerry Curve. I hope RIM takes the time to at least change up the default backgrounds on the devices they're showing off at CES. Oh, and if you want Erika's Buttercup Powerpuff Girl wallpaper you can get it here. CES is the big daddy of electronic shows each year. I'm wondering hoping RIM uses the event to drop news about the rumored BlackBerry 9000 series of smartphones. Any bets? I guess we soon shall know! If you want to stay on top of RIM's activities at WES, you can sign up to receive email updates straight from the show.